We were pretty excited back in April when we saw the outcome of the Auckland Transport Alignment Project, which will see significant development of our transport network, and especially our public transport system, over the next decade. 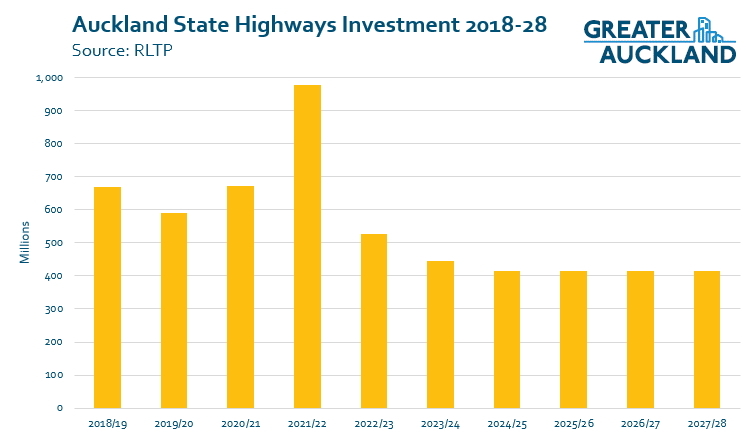 That was backed up in May with the release of the draft Regional Land Transport Programme (RLTP) which listed in more detail which projects would be funded over the coming decade. But over the course of a decade there’s a good chance we’ll see the political landscape change. A future government or council could cut funding meaning a project not due to be funded for nine years may never get funded. Yesterday the Auckland Transport board meet and approved the RLTP. At the @AklTransport board they’ve approved the regional land transport plan. With one change: “city to airport” light rail will now be referred to as “city centre to Mangere”. Sensible. Unlike with the draft, this time the list of capital projects breaks down the plans into what year/s they are expected to be funded over. As you’d expect, there are some interesting outcomes. With other agencies taking over most of the big PT projects like City Rail Link, Light Rail and some busways), that leaves AT to focus on the Eastern Busway and other bus improvements. There are also other bus projects, such as double decker mitigation, rolling our infrastructure to support electric buses and the addition of bus lanes to existing roads. The graph below shows how the bus investment changes over time. You can really see the impact the City Rail Link is having on the programme of rail works. With the CRL due to open in 2024, there’s clearly a need to get the wider network improved before then so that more services can be run. This can be most plainly seen in the Kiwrail list of projects. Within the $990m of projects over the decade, $794m will completed by 2024 including electrification to Pukekohe along the third main between Otahuhu and Wiri. In addition to the physical infrastructure, the second tranche of electric trains are due to arrive by 2020 and the third tranche should be here by 2026. With $258 million budgeted, that could suggest up to another 32 trains for the network. 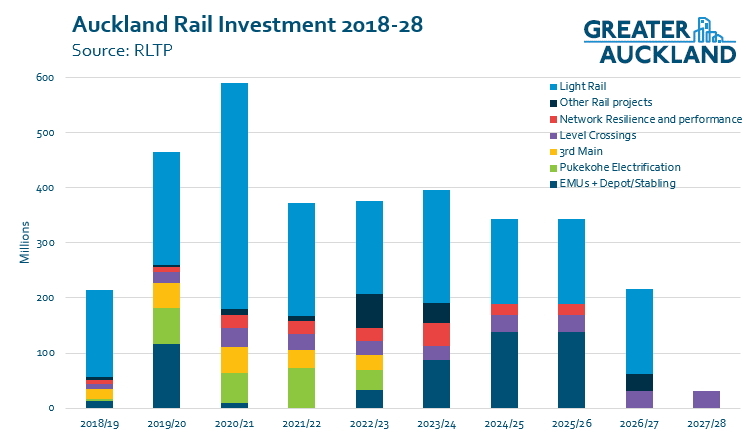 Funding for light rail is spread over the years from 2018/19 to 2026/27 with the largest amount in 2020/21 – although I imagine the exact timing will be refined as the project progresses. The biggest piece of news for cycling is that Skypath should be open in around 2022. 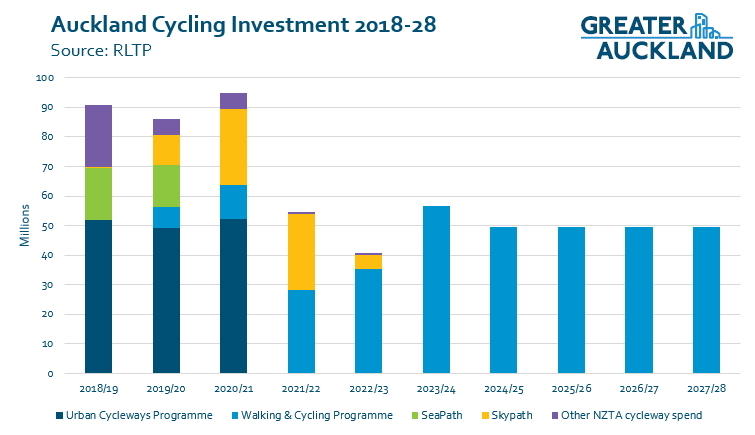 For the rest of the programme, as we’ve discussed before there’s millions missing from the cycling budget as AT seem to be counting projects from the Urban Cycleway Programme, which were meant to be completed by the end of this month, in the figures for the next few years. You can see from the graph below that funding really falls off after the first three years. Given there’ll be a new version of the RLTP at that time, correcting this will need to be a key focus. The plans still contain plenty of state highway projects. Here I’ve just grouped them together but they range from large motorway projects, like the Northern Corridor (which includes the busway) down to small projects like intersection improvements on some of the rural state highways. Finally, there were a number of projects that didn’t really fall into the categories above, I’m not going to bother graphing them but I will call a couple out. Given our over-reliance on modelling, you’d think it would be a priority to get it right. Transport Demand Forecasting Models Update: That unfinished sentence at the end is copied correctly from the document. ‘This is a joint project between the New Zealand Transport Agency’ and who? Is this why it won’t be funded for a while? Are they looking for new modellers? 🙂 Should I be getting excited that they’re looking to forge a relationship with people who haven’t been on the gravy train using debunked methods that skew the business cases towards roads? I personally think that’s a bit harsh heidi. Just the other day this blog was discussing ATAP modelling results that predict significant growth in PT patronage. The anti-modelling view of many on this blog really does go too far sometimes. We’re talking about largely decent people, many of whom are dedicated public servants, who agree that we should be using models more carefully. And who are working hard to address technical issues. I would also argue that international evidence shows modelled demands are usually overstated due to bias towards investment, regardless of the mode. See research by flyvberg et al. Traffic Models: Continuing to use models that do not reflect the trips generated by new roading capacity has led directly to skewed business cases that support road building. This has occurred during a period when these models have been thoroughly debunked in the literature. A professional using these models should ensure the clients understand the limitations of the models: useful for prediction of relative traffic flows at a point in time, and absolutely not useful for decision-making in transport planning. Misuse of the models has led to further car dependency, loss of accessibility and opportunity, unsafe and unwalkable environments dominated by cars, carbon emissions, congestion. If I only had a substandard model at my fingertips and it was being used to cause such harm because the clients were using it to justify their political purposes, I would resign and blow a whistle. Public Transport Models: Not something I have looked into, and I mean no slight to people working in this area. Apologies to anyone who may have taken offence. Regarding the cost of the Auckland Train Control – I wonder if they’ll be hosting that at the KiwiRail head office. Last I checked, the space vacated by IT two years ago was still free. After moving staff between floors, that’d work really well. All the 24/7 administrative workers in one building (minus Wellington TC). My Eden Station design includes TC centre space allocation. There appears to be quite a bit of money on pedestrian rail grade separation until 2022 and road / rail separation throughout the years, do we know how many pedestrian rail crossing will be removed ? and how many road crossings? And what the priorities are? There seems to be a lot of funding for bus lanes. Expensive paint? Or does it cost that much to do the endless consultations with businesses? It depends on the standard to which they are done. Of course paint is cheap. But if bus lanes are combined with decent shelters, indented bays and minor works to get priority at intersections I could easily imagine them spending what is listed. Also buses are heavy vehicle loads so a bus lane may need a pavement overlay. Still a good investment IMO. A pavement overlay won’t cut it for bus lanes, they need structural asphalt. That’s where a lot of the money will be going. Though I agree kerb and channel realignment and intersection upgrades will also account for a lot of the spending. For those unfamiliar with the way we build roads in NZ: We build them as cheaply as we can get away with. This usually involves compacting layers of aggregate (crushed rock) to make an unbound granular pavement and then surfacing it with a wearing course of chipseal or asphalt. If the traffic loads are too heavy for this then heavier-duty asphalt is laid on top of the aggregate as a structural layer, this is then surfaced with wearing course asphalt. Road owners try and minimise the amount of structural asphalt they have to use since it’s around ten times as costly as unbound granular. A typical road that is a candidate for bus lanes will carry plenty of buses and currently have a lane of traffic in either direction and parking on the shoulders. The traffic lanes most likely already have structural asphalt under them but the shoulders won’t. The shoulders will need to be reinforced before they can carry buses. On alternatives: Yes aggregate can be cement stabilised or foam bitumen stabilised (becoming a bound granular pavement). Both options are cheaper than structural asphalt and will last for a few years before inevitably failing and being replaced with structural asphalt anyway. We have been using this flexible pavement construction for many years and we should know how to do it by now. Compaction layers and placement methods that don’t change the aggregate design envelope are important. and doesn’t seem to be understood by present site supervision (if sites are supervised). The question arises as to whether this pavement is suited to the increased vehicle mass that we are now using and the driven axle torque applied to the upper layers to distribute the loads. Look at the areas around bus stops and their braking and accelerating zones. Especially on the newer streets. Also on the close radius turns of container delivery vehicle to business’s. These affects are considerable and really noticeable when you cycle around south Auckland. Fourth main, at least enabling works to get bridge spans and corridors available to make it easy to do if it’s not going to be done at the same time as the third main. Not great to delay the third main any longer just to save time and money on a fourth main that is still 10-15 years away. Given limited industry capacity and cost of interest, it probably doesn’t save time or money anyway. Calling the LR City Centre to Mangere is a simply step but a very good one. It is a project to provide PT services to areas that include the airport. I also agree with calling the LRT City to Mangere instead of the airport. The business case showed the bulk of the demand is along the way to the airport, not at the end. Plus if the Airport corporation gets difficult about access across their land, it would be a shame to delay starting the rest of the project for the sake of the last few kms. Once the LRT is operating the airport would have little choice but to agree to a station on their site. There is no “business case”. The Govt are undertaking one due to be released next year. That will be undertaken with Treasury to decide if the numbers do stack up. The section between Airport and Mt Roskil is likely to not carry large numbers of passengers needed to obtain a very solid BCR for the type of investment (+$2 Billion) for that section. My bets are it will be canned and you’ll all be forced onto buses to the airport. I cannot see any funding for building the third main to Papakura let alone the fourth main. Is that to be funded with federal funds to KiwiRail? I wish we could get federal funds. But we’d need to be part of a federation first! Unfortunately, there are 2001 reasons why NZ won’t join the Commonwealth of Australia. 2000 are the kilometres across the Tasman; the other one is, NZ doesn’t want to. Wow, so none of you know that anyone promised to build the third main before that last election. Sorry I asked. I will not bother you again. BTW, we really need a Greater Sydney Blog over here in the federation. Our politicians are still stuck in the building roads wins votes mode. And then the nutters close a perfectly good heavy rail line to convert it to a metro…not only once but twice. Peter your politicians have far worse problems than building roads. They are still detaining people and sending them to an island in the Indian Ocean specifically to separate them from their families. Even Donald Trump backed down on that. Australia need to fix human rights before they worry about transport. Jesus Christ it makes you scream with rage at that monster, doesn’t it? Heidi I try to just be amused by Trump and I try to see the funny side of the USA damaging itself through putting him in power. But separating children from their parents is beyond comprehension. But I reserve special scorn for our Anzac neighbours and their treatment of New Zealanders, their imprisonment of people on Naru and New Guinea, their white Australia policy, terra nullius, their abusive cheating cricketers and their pathetic nationalism. So I have taken on myself to dis them on any website where they pop up. I can’t change the USA but I can annoy Australians. Peter – my guess would be they realised the 3rd main between Wiri and Papakura just isn’t needed in the near future and have quietly dropped it to use the money elsewhere. It will probably start coming up again once regional rail is up and running as it would be beneficial for running express intercity services. Good for you Miffy – I wish Aussies could see themselves as we see them. “my guess would be they realised the 3rd main between Wiri and Papakura just isn’t needed in the near future”. Needed or not, there won’t be express services from the “far south” without it. Absent those express services driving will still appear more attractive for many. All-stop services from Pukekohe and Papakura are painfully slow. MFD – I agree regarding express services from the south. However, these really need a third main from Westfield to at least the Purewa tunnel, not further south. It makes a lot more sense to have express services that also include Takanini, Manurewa, Homai etc that skip some of the stations closer to the city. This would give a better service and could be run more frequently due to higher patronage than express services just for Pukekohe and Papakura. Matt, have you published the right numbers? Where is the huge focus on PT and the diminishing spend on roads that Phil Twyford spoke of? Where is the world’s best PT system that you spoke of yesterday? The spend is in decline from 2023. Is there an arrangement where it is then funded from Lotto or something? Ha! I think I’ll print out the yellow bar chart. What an obnoxiously large amount of money to spend on state highways. That yellow means: VKT, DSI, congestion, and climate change – bring it on! Heidi, why not the chart above it? What possible rationale can there be for spending on local roads to more than double annually over the period? How will that help? I saw the video yesterday with Mayor Goff admitting congestion was going to increase, but no move to congestion pricing to address it. Ten more years of shambles! I am going to the climate change meeting this afternoon. It will be interesting to hear how these increasing vehicle emissions fit with the carbon zero target. What we appear to have from the above tables is another Countdown moment (you know, where you remove plastic bags to replace them with even more damaging larger bags). Total spending on bus = rail = $$4.95 billion. Total spending on State highways = local roads = $9.6 billion. So despite the surveys saying that 60% of Aucklanders want better public transport we spend more on everything but this. Time for a new mayor? I’m uncertain that the Mayor is the true problem, I’d be looking at the culture in the organisations that provide the advice and generate the plans, primarily AT and NZTA. 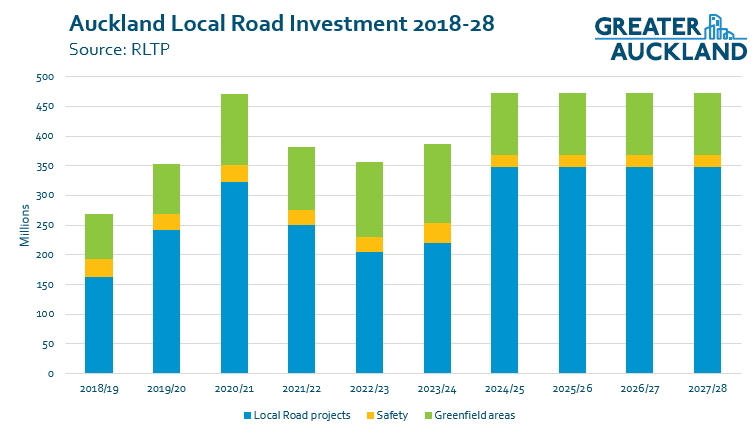 I assumed that a significant part of the road spending was maintenance of the current assets – this is a significant part of AT’s road spending. DavidB, why have you assumed that? The table states that it is new projects – brand new roads and lane extensions – more of the same – disgraceful! I take it that the proposal for battery powered Emu’s has been dropped ? I suppose the only positive is that the Nats also supported the electrification to Pukekohe so if they win next or next election they may keep on track. 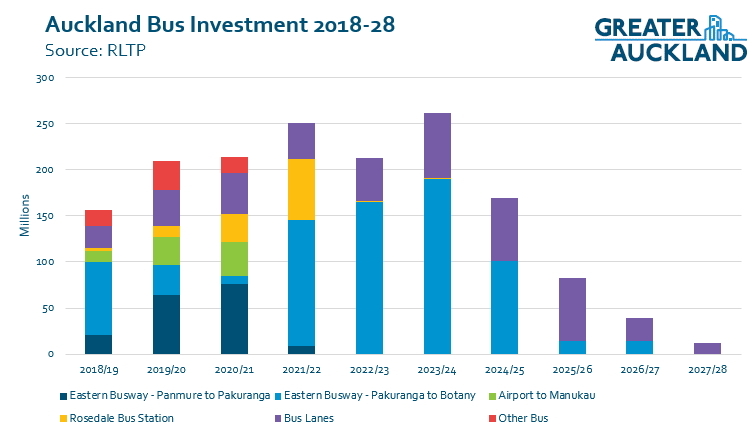 Your village gets not only a regular bus doing the 40km round trip to Pukekohe all day, seven days a week, it also gets an extra peak bus route running express to Papakura. That’s actually pretty bloody good for a settlement of 3,000 homes located 30km away from the edge city. That sure looks like a business case and sure does show that mangere and onehunga deliver far more patronage than the airport. AT are developing a more detailed business case. The one that is finished confirmed the corridor and mode. The one under way will confirm the route and enable AT or NZTA to apply for resource consents and designations. The report mentions a BRT/heavy rail hybrid as an investigated option then dismisses it due to transfer penalty at Onehunga. I expect a BRT/LRT hybrid with transfer will be proposed next to save on a Mangere inlet crossing and assist airport shuttles and coaches like the Northern Busway does. “Tranche 1 – Level Crossing Grade Separation … in areas with the best immediate prospects for construction, building an initial tranche of grade separated road crossings”. This is good but what about the hard ones, those that have previously been identified as highest priority that are unfunded? “Carrington Road Improvements – bus lanes 2021-2027”. I hope this occurs after building a better crossing for the western cycle route, e.g. underpass beside the motorway. crossing of the Waitemata Harbour. $61.5M. What these expensive activities?